With the addition of CORE Outdoor Power zero-emission outdoor power equipment, Central Power Systems now offers a market spanning suite of eco-friendly product options for the homeowner, commercial landscaper and turf & grounds care professional through its extensive network of dealers and retailers across Ohio, Indiana, Michigan, Maryland, Western Pennsylvania, Kentucky, West Virginia and Florida. 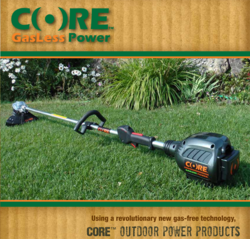 CORE GasLess Outdoor Power equipment combines a revolutionary motor technology with newly developed, state-of-the art fuel cells to offer a practical no-emission solution for the professional landscaper. With none of the iron or cooper windings found in traditional electric motors, Conductor Optimized Rotary Energy (CORE™) motors are radically different utilizing a multi-layered circuit board to form a stator that works in conjunction with permanent magnets to very efficiently produce high torque. CORE™ air-cooled motors are extremely lightweight and have the ability to produce as much power as the two-cycle gas engines used for a variety of professional and consumer outdoor power equipment products. With zero emissions and low noise yet performance, torque and power equal to a two-cycle engine, CORE™ technology is poised to revolutionize the market for commercial outdoor power equipment. Positioned for the upper-end residential to the true professional user, CORE Outdoor Power neatly complements Worx Yard Tools and DOLMAR Power Products to fill out Central Power Systems’ market spanning offering of eco-conscious equipment. Worx Yard Tools, positioned for the consumer-end of the no-emission landscape equipment market, offers an extremely retail-attractive series of battery and electric yard products and has, in a very short time, become an established eco-friendly alternative to engine-powered outdoor power equipment among residential users. With extensive consumer advertising, engaging retail packaging and appealing price points, the Worx brand was conceived, developed and designed specifically for the retail consumer market. At the other end of the spectrum, DOLMAR Power Products has long served the commercial turf & grounds care markets. And with the introduction of the innovative DM4 line of true 4-cycle engine-powered tools, DOLMAR now offers a real eco-conscious gas-powered solution for the pro-user. Especially attractive to municipal, facilities management and other large scale, high volume landscape maintenance professionals, DM4 provides superior commercial-grade performance and durability yet significantly reduces fuel consumption, exhaust emissions and noise over traditional 2-cycle machines. Serving complementary markets within the outdoor power equipment industry the three lines together, Worx Yard Tools, CORE Outdoor Power and DOLMAR Power Products, provide Central Power Systems a complete offering of landscape maintenance solutions designed to reduce the negative environmental impacts of exhaust emissions and noise without sacrificing performance and productivity. Central Power Systems aligns state-of-the-art distribution, direct sales, customer & technical support and certified service training to offer the most complete brand, service and product support in the industry. As full line distributors of Briggs & Stratton engines and parts, Murray brand service parts, Worx Yard Tools, DOLMAR Power Products, Briggs & Stratton portable generators and pressure washers, Masport lawnmowers, CORE GasLess Outdoor Power, Carlton forestry products, TrailerMate cargo management systems, NGK and Champion spark plugs, and a full line of Fuel Solutions from leading brands like Mechanic In A Bottle, Opti, Star*Tron and VP Racing, we supply an independent network of over 6,000 sales & service locations throughout the Midwest and Florida.